This photodigital Camera Motion Image Capture of light through trees, pulling light-stretching light bears a resemblance [my say], to tall buildings in a city, as skyscrapers–a skyscraperscape.-Ernie Moore Jr. This is not graphic art. It was done in the camera so-to-speak (shake-a-can), not through software on the computer. That’s kinda the point–to avoid graphic designing by software and getting images on the spot that are othterwise noticed not.-Ernie Moore Jr. There might be considered a soft quality as light through murky water. Imaging thins as if under water might come be an area/style of Camera Motion Image Capture.-Ernie Moore Jr.
And there might be a suggestion of a face in brown on the right-hand-side–Image-within-an-Image-Ernie Moore Jr. 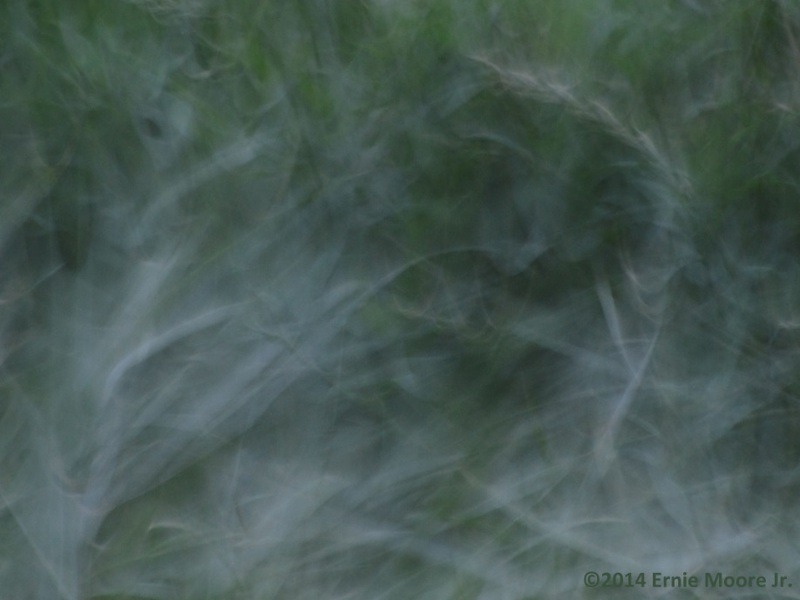 This is an Image Capture Camera Motion of grass. Image within an Image seems as though a face of a figure through what might be taken as seaweed. At smaller image sizes than when clicked on one might see a Dutch maid looking face. Slight pulling of light-stretching of light gives a seeming glow that attracted me to this piece.